RT type introduced on Saturday albeit off 107A allocation. RT type introduced on a daily basis. Extended from Borehamwood to Edgware via withdrawn Route 141 and then onto Queensbury. Withdrawn from Barnet By Pass and diverted in Borehamwood as shown above. Converted to single deck OPO operation. 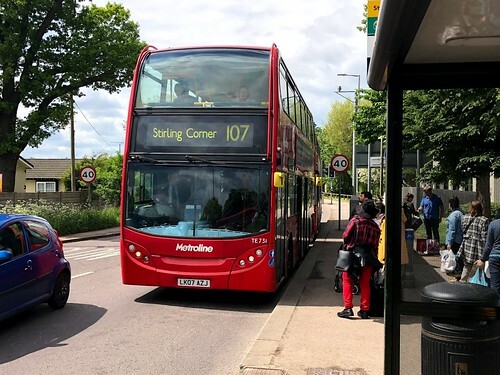 Route 107A withdrawn thus Sunday service introduced and whole route diverted at Ponders End to Enfield Lock via withdrawn 107A. Mon-Fri service withdrawn between Enfield Highway and Enfield Lock - replaced by new 107A. QUEENSBURY ( Mon-Sat ) - EDGWARE STN (Sun) - Ponders End - Hertford Road - Green Street - BRIMSDOWN STATION. Rerouted at Ponders End to Brimsdown Station replacing Route 135. The Enfield Lock section replaced by revised 121. Withdrawn between New Barnet and Brimsdown - replaced by new 307. Diverted eastbound via Edgware Station. Operation transferred to Pan Atlas with new Leyland Olympians. Rerouted via new interchange at Borehamwood and Elstree Station both ways but then towards Barnet only from 06.08.94 when problems with clearance arose from the introduction of Leyland Lynx single deckers. SDO double deck journies withdrawn. Renewal of contract with Metroline. I ony ever did the 107s on a Sunday but we went through to Enfield Lock which was a very pleasant day out. We would pop in the Royal Small Arms tavern for a shandy on one duty as we had a long layover.